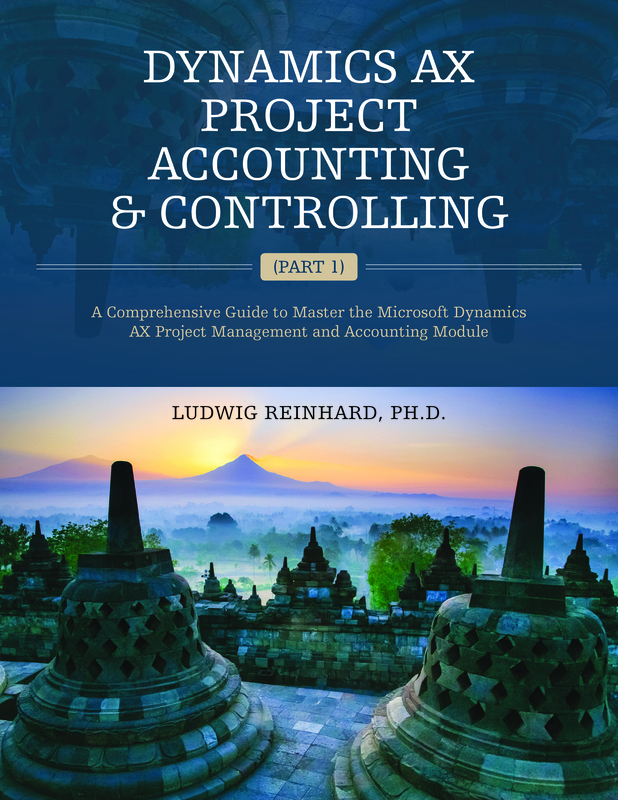 After analyzing purchase related transactions in the previous chapter we will now move on and take a look at the other business areas where differences between the COS and NOE accounting method can be identified. The next area where such differences can be recognized is related to adjustments of a company’s inventory. Whether or not the COS and NOE accounting method can also be applied in parallel for inventory related adjustment transactions will be investigated next based on the following sample transactions. Note: Transfer orders within and between sites/warehouses and other item related transactions that do not generate ledger vouchers will not be analyzed in the following. 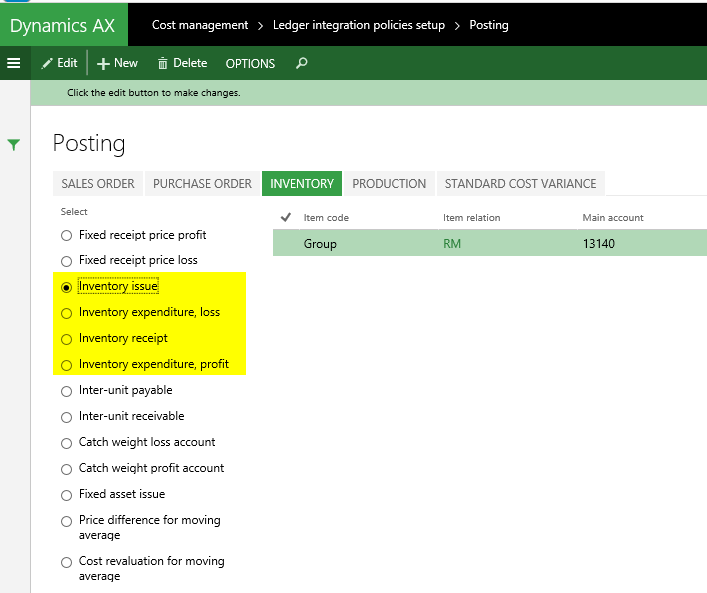 For reasons of brevity, no Dynamics AX screen-prints of the created inventory adjustment postings will be provided but rather a summarized overview of the ledger postings created when recording those transactions (please see the next illustration). Note: The main accounts required to be setup for the inventory adjustment transactions recorded can be found in the inventory section of the inventory posting matrix shown in the next screenshot. In the prior illustration one can see that the Income Statement that follows the COS method incorporates the inventory profit and inventory loss accounts (no. 53150 & 53160) in the cost of sales section. Whether or not those accounts are better assigned to another Income Statement section – such as the other operating expense section – is not important for the general question whether or not the COS and NOE accounting method can be applied in parallel for inventory adjustment transactions. What is important though is the question where to incorporate the inventory profit and inventory loss accounts according to the NOE method. Against the background of the explanations provided before, this question can be answered by stating that those accounts need to be incorporated into the stock variation section of the company’s Income Statement. That is because those inventory adjustments represent nothing else than “small” stock adjustment transactions that replace the “large” month-end stock variation transaction required for the NOE method. 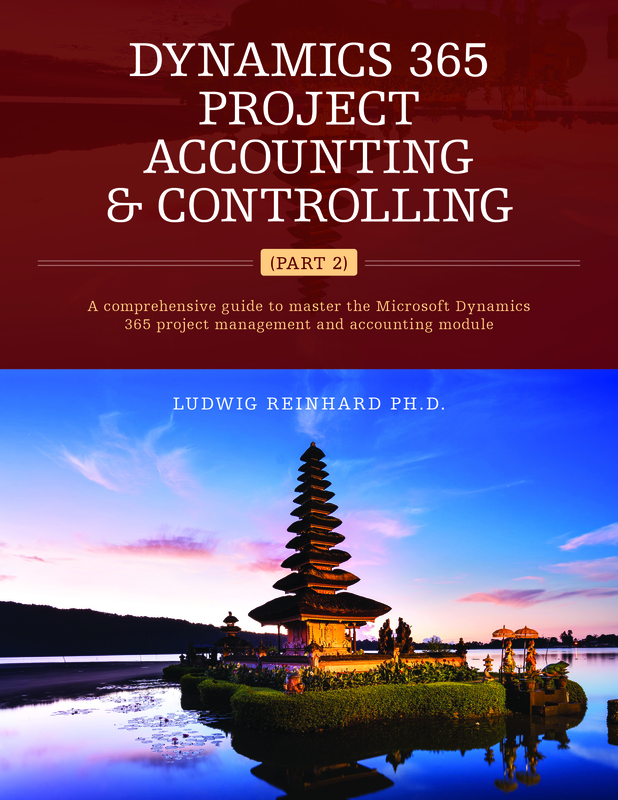 Within this subchapter I will deal with the question how to record and disclose salary/wage & other operating expense related transactions in the financial statements that follow the COS and NOE accounting method. The major difference to what has been shown previously is that the separation of the transactions according to their function of expense is now made through referencing the financial cost center dimension as exemplified in the next illustrations. The financial statements resulting from the transactions recorded can be identified in the next screen-print. An investigation of the Balance Sheet related transactions does not bring a specific notable outcome to light that deserves special attention. That is because the amounts shown on the other liabilities & accounts payable accounts (no. 22600 and 22500) increase due to the salary/wage & electricity expense transactions recorded. What is notable though are the account balances shown in the Income Statements for the COS and NOE accounting method. In this respect it can be observed that the COS Income Statement shows the different amounts split up by functions (cost centers) whereas the NOE Income Statement shows those amounts on a summarized basis. Another disadvantage of the NOE method is thus that this method does not provide users with the same level of detailed information as the COS method. 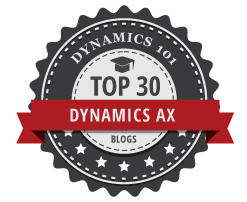 Recording and disclosing fixed asset related transactions does – in principle – not differ from the salary/wage & other operating expense transactions shown in the previous chapter. That is because also for fixed asset related transactions a separation of the different transactions through the use of a financial dimension is necessary in order to generate the Income Statement for the COS method. … before the related depreciation expense transactions were recorded. The outcome of those transactions can be identified in the next Management Reporter report that shows the fixed asset acquisition and fixed asset accumulated depreciation accounts in the company’s Balance Sheet on the left-hand side. 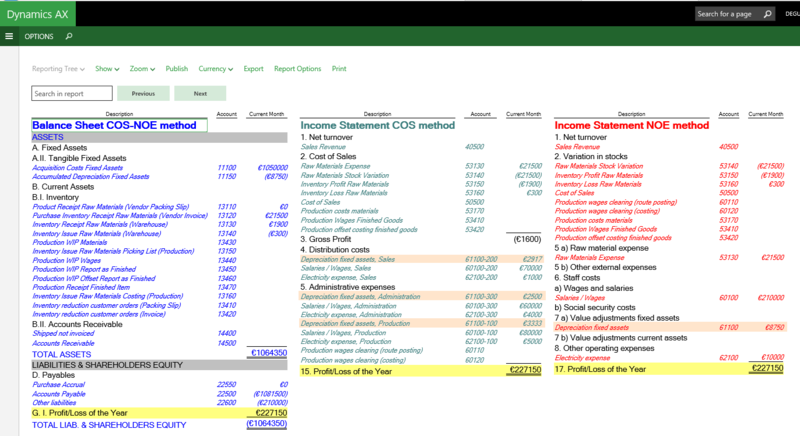 In the middle part of the report one can identify the Income Statement that follows the COS method. From there it can be observed that the depreciation expense is split up by corporate functions by making use of the recorded financial (cost center) dimensions. 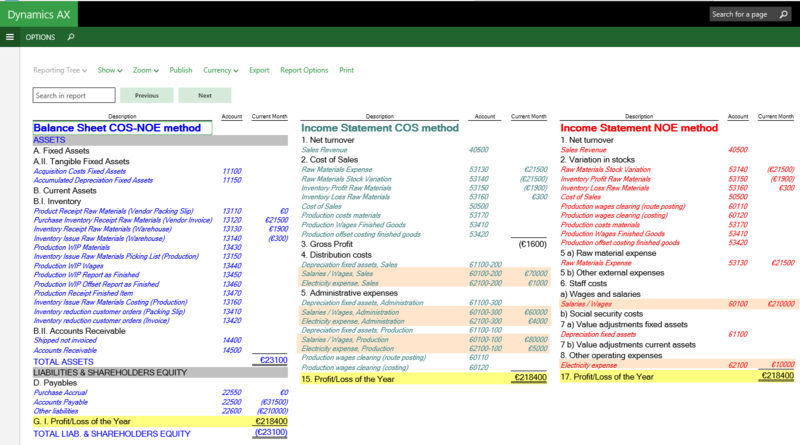 The Income Statement following the NOE method illustrated on the right-side does – on the other hand – summarize those transactions in a single line and does thus not allow an immediate analysis of the expenses recorded. 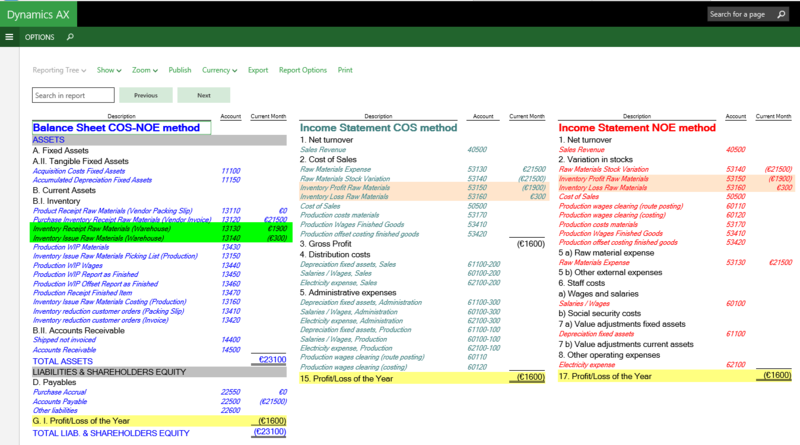 In addition to the purchase related item transactions shown in the previous part, it can be summarized that also transactions related to inventory adjustments, salary/wages and other operating expeses as well as fixed asset related transactions can be posted in a way that allows the parallel generation of Income Statements that follow the COS and NOE method. Please not that you can of course also use separate “function-related” ledger accounts – rather than financial dimensions – for separating the different corporate functions in the COS Income Statement report. Yet, irrespective of what approach you chose for separating the different corporate functions (financial dimensions or separate ledger accounts), the most important thing that you have to take care of is that a consistent and integrated approach is followed in your company which ensures that the financial reports according to both accounting methods can be generated out of the box.